Today, instead of writing about a meal I prepared, I wanted to write my review of a restaurant I visited. It’s called Glass House Tavern, http://www.glasshousetavern.com located in the heart of the Theatre District in New York City, 252 West 47th Street, between 7th and 8th Ave. The first time I ate there was a very pleasant surprise. I had some drinks and appetizers and found the food to have amazing flavor. Having a waiter that was very friendly and pleasant was also a nice bonus. So, I said that it was worth revisiting. Now, in New York City, there are about 20 restaurants per every square block, so you can just imagine how many there are to choose from. But if you visit the Theatre District, you should definitely give it a go. The restaurant has an “A” rating, which is a must for me. That is given by the health inspection, so you know you are dining in a clean restaurant. The staff is very inviting and courteous, another must for me, and lastly, the menu offers a nice variety, mainly seafood which tastes great. 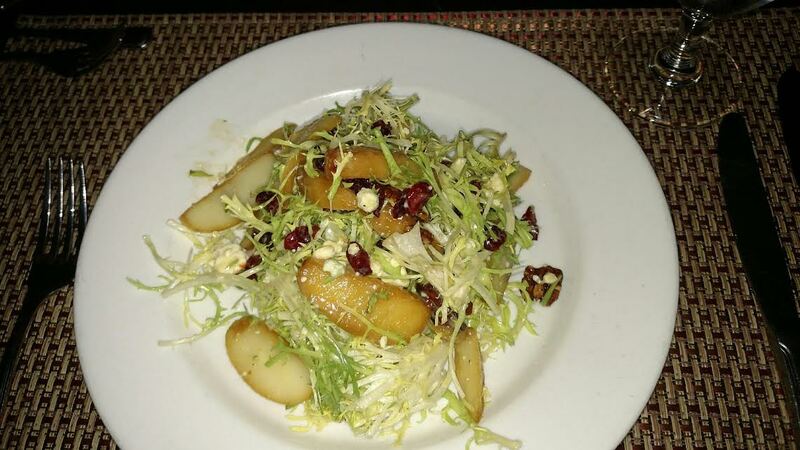 This evening, I ordered their special salad which was a Frisee salad served with warm apples, walnuts and roquefort cheese. Simply delicious and quite filling. For my main meal, I ordered the seafood paella. This flavorful meal consisted of shrimp, scallops, calamari, mussels & cockles served in a bed of saffron rice, peas & chorizo. I highly recommend this dish because not only does it look delicious, the aroma and taste are wonderful and very pleasing to the palette. So, next time you are visiting New York City and are in the theatre district, check out this restaurant and let me know your thoughts. As always, Enjoy! Next Post No Gift Receipt Required. Thank you for your comment. Let me know if you try their menu and what your thoughts are about your meal.